O God, who made the Abbot Saint Bernard a man consumed with zeal for your house and a light shining and burning in your Church, grant, through his intercession, that we may be on fire with the same spirit and walk always as children of light. Through our Lord Jesus Christ, your Son, who lives and reigns with you in the unity of the Holy Spirit, one God, for ever and ever. 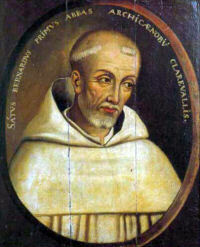 St. Bernard (1090-1153) was born near Dijon and died in Clairvaux, France. He was of a noble family and received a careful education in his youth. With his father, brother and thirty noblemen he entered the Benedictine monastery of Citeaux. Two years later he led a group of monks to establish a house at Clairvaux, and became its abbot. The monastic rule which he perfected at Clairvaux became the model for 163 monasteries of the Cistercian reform. He was a theologian, poet, orator, and writer. He is sometimes considered as a Father of the Church. Bernard, the second founder of the Cistercians, the Mellifluous Doctor, the apostle of the Crusades, the miracle-worker, the reconciler of kings, the leader of peoples, the counselor of popes! His sermons, from which there are many excerpts in the Breviary, are conspicuous for genuine emotion and spiritual unction. The celebrated Memorare is ascribed to him. Bernard was born in 1090, the third son of an illustrious Burgundian family. At the age of twenty-two he entered the monastery of Citeaux (where the Cistercian Order had its beginning) and persuaded thirty other youths of noble rank to follow his example. Made abbot of Clairvaux (1115), he erected numerous abbeys where his spirit flourished. To his disciple, Bernard of Pisa, who later became Pope Eugene III, he dedicated his work De Consideratione. Bernard's influence upon the princes, the clergy, and the people of his age was most remarkable. By penitential practices he so exhausted his body that it could hardly sustain his soul, ever eager to praise and honor God. Patron: beekeepers; bees; candlemakers; chandlers; wax-melters; wax refiners; Gibraltar; Queens College, Cambridge. Symbols: beehive; bees; three mitres on a book; white dog; inkhorn and pen; Passion implements; fettered demon; book. Often Portrayed As: Cistercian having a vision of Mary; Cistercian with a beehive; Cistercian with a chained demon; Cistercian with a mitre on the ground beside him; Cistercian with a swarm of bees nearby; Cistercian with a white dog; Cistercian writing and watching Mary. Though of a rich and noble family St. Bernard continually asked the question: "For what purpose are you on earth?" Spend some time today in front of the Blessed Sacrament and ask yourself this question. Because St. Bernard is the patron of candlemakers, a great project would be to learn how to make candles. Candles 101 discusses in brief about making homemade candles, rolled, dipped and molded. Practicing making candles now will help in preparing to make a family Christ Candle for Advent and Paschal Candle for Easter. Read more about the life of St. Bernard. This site — complete with words and midi files — features hymns written by St. Bernard. Learn more about the Cistercian Order founded by St. Bernard. From the Catholic Culture library: Preaching Conversion Through The Beatitudes: Bernard Of Clairvaux's Ad Clericos De Conversione and Pope Pius XII On St. Bernard Of Clairvaux, The Last Of The Fathers.